From afar the designated bird sanctuary of Man-O-War Caye looks like any other tiny mangrove island, but as you journey closer to shore the frenzy of activity becomes apparent, with birds soaring in the sky above in every direction… and the guys strutting their stuff (or inflating their red gular pouches) for the ladies during breeding season. Man-O-War Caye lies around 70 miles south of Belize City close to South Water Caye. 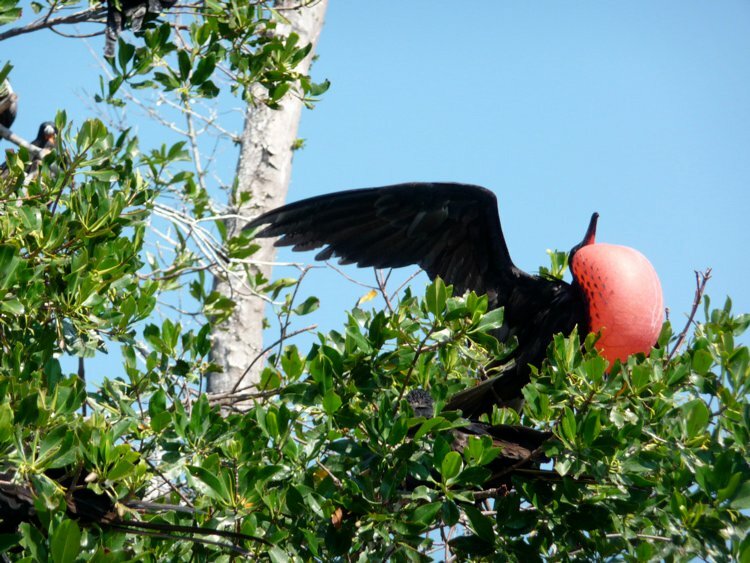 The 3 different types of mangrove vegetation provide a perfect sanctuary to a variety of indigenous bird species, including Pelicans, Brown Booby birds, and the Magnificent Frigate birds (also known as Man-O-War birds). Here is our pick of pictures….